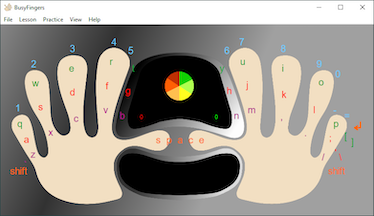 BusyFingers is a touch typing program that has been designed specifically for young children, but it can still be used by adults. The novel user interface really does appeal to children and once they've started, they want to keep on practising. BusyFingers v5 was released on 06-Mar-2015. The MyKids keyboard & mini mouse have been designed specifically for young children. The keyboard is approximately 80% of the size of a standard adult keyboard and its smaller keys and spacing allows children to use the correct finger for each key, without having to over-stretch. With this keyboard, children can learn to touch type with the greatest of ease. And what's more, the MyKids keyboard comes complete with a mini mouse, so children have greater control over the cursor too! Stickers, designed specifically for the MyKids keyboard, with lower case letters, are available.